The HAL-Sukhoi row over spare parts and payments to Russian specialists is impacting the availability of the IAF’s Su-30MKIs. Is it time to press the panic button? The cyber attack on Russian communication systems by anonymous hackers this month has raised concerns about the maintenance of the Su-30MKI, India’s air dominance fighter. According to the leaked correspondence between Hindustan Aeronautics Ltd (HAL), which assembles the Su-30MKI under licence in India and Russia’s United Aircraft Corporation (UAC), 50 percent of the Flankers are said to be unfit for operational flying. In comparison, the Indian Air Force’s MiG-29 fleet readiness rate is around 75 percent, which is on a par with US Air Force (USAF) levels. An earlier letter from December 24, 2013 says due to non-availability of facilities for overhaul of aircraft parts, “the serviceability of Su-30MKI is slowly decreasing and demand for aircraft on ground items on the rise”. It was agreed the Russian side would establish facilities at HAL by December 2013 and overhaul the first aircraft by June 2014. The letter says, the matter was discussed and agreed upon by Russia during various high level forums. “India itself is often at fault in these scenarios, and indeed they’re reportedly haggling over price,” it says. While HAL has been prodding Sukhoi to expedite matters, the Indian company isn't entirely blameless when it comes to supplying spares it is contractually obligated to manufacture. In this case, the victim is the Algerian Air Force. In a February 2014 letter Vyacheslav Lozan, After Sales Director at Sukhoi, reminds Sunil Kumar, General Manager, HAL, to stick to the contract to supply parts to the Algerian Air Force. “Taking into account the fact the Algerian party insists on delivery of all the indicated equipment of HAL's manufacture, we have to admit it is impossible to exclude the indicated items from the contract,” he says. HAL, however, does not deserve all the flak. In December 2012 it had floated a tender for “civil works extension of building for Su-30 ROH (repair and overhaul) project” at the company's plant in Korwa, Uttar Pradesh. At the same time, Sukhoi cannot get around the clause in the support contract that states Russian specialists are to be posted even if price negotiations aren’t finalised. Considering India’s clout as the world’s largest arms importer, it is owed a good explanation. Is the IAF in trouble? 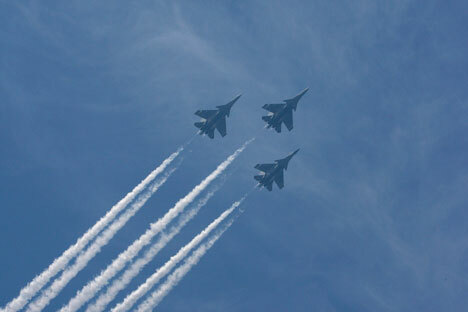 As of March 2013, the IAF had 194 Flankers and HAL’s production rate is 12 aircraft per year for an eventual total of 272. While neither the Russian nor Indian side can duck the blame for the state of affairs, media reports that the Flanker fleet is in trouble are overly alarmist. Currently just 20 aircraft – the equivalent of a single squadron – are affected by the Russia-India standoff. Assuming the 50 percent fleet readiness reports are true, will the IAF manage to fight a war with roughly 100 Flankers reporting for combat duty? The short answer: depends on the enemy. The Pakistan Air Force (PAF) currently has 63 American made F-16s and 49 Chinese made JF-17s of doubtful quality. Against these numbers, not counting the Sukhois, the IAF has 59 MiG-29s, 49 Mirage 2000s, 254 MiG-21s, 79 MiG-27s and 117 Jaguars. It’s a complete mismatch and when you factor in the much better quality of Indian pilots, there’s simply no contest. The IAF is in an entirely different league. In the 1971 War it had established air superiority by the 10th day of fighting, and the PAF brass had ordered its pilots to stand down to avoid further crippling losses. In the 2012 report “Airpower at 18,000 feet: IAF in the Kargil War”, the Carnegie Endowment for International Peace says, when MiG-29s were providing top cover for IAF aircraft blasting Pakistan Army positions, the “PAF F-16s to the west typically maintained a safe distance of 10 to 20 miles on the Pakistani side of the LoC”. It’s, therefore, abundantly clear that even without the Flankers joining the fight, the IAF is likely to grind down the PAF. However, the equation is different if Islamabad and Beijing join hands. As the current air chief said recently, the IAF cannot take on a joint attack by the two. The Sukhoi thus becomes critical in a two-front war. For comparison, the USAF’s most expensive aircraft, the super-secret B2A stealth bomber, has a fleet availability rate of just 46.7 per cent. That's dreadful for an aircraft costing $2.1 billion. The B-1B bomber fleet availability rate is 57.9 per cent and America's newest and most expensive fighter, the F-22 Raptor, despite its $350 million price tag has a fleet availability rate of 69 percent. Malfunctioning of cockpit displays and mission computers is unusual in high-end aircraft. The Flanker is acknowledged to be superior to every combat jet except arguably the F-22. The IAF and Sukhoi need to figure out how this is happening especially when Malaysia and Indonesia, which fly a similar Flanker, haven’t experienced these glitches. Was it a malicious virus or just poor maintenance? Also, India’s Defence Ministry, which has the agility of a sloth on tranquilisers, should not be allowed to get in the way of the IAF establishing a dedicated Flanker ROH facility. The Su-30MKI is the key element in India’s strike force; delay is not an option.